We all know that poor posture isn't flattering. However, in reality, posture affects our health and well-being in numerous ways. And one particular posture problem, has significant impact on our longterm health and wellbeing, and medical science is just starting to catch on to this fact. We are talking about forward head posture and it’s more advanced relative, hyperkyphosis. You may have heard of the new concept of ‘text neck’– which is essentially forward head posture, where our head is forward of the center. In its more advanced stages, forward head posture may develop into hyperkyphosis. And, hyperkyphosis, as we shall see, is the precursor of pretty much any age-related condition you don’t want to have. What is hyperkyphosis and why should you care? In the last few decades, researchers have become increasingly interested in the health effects of a hyperkyphotic posture in older people. And, what they are discovering is pretty remarkable. You’ve heard about osteoporosis and how important it is to prevent osteoporosis-related loss of bone mass to avoid fractures as you get older. But here’s what you probably haven’t heard: A slumped forward posture—if allowed to mature into the full-fledged hyperkyphosis of old age—puts you at risk for the exact same issues as osteoporosis. Yes, you heard that right – hyperkyphosis is a risk factor for the same problems as osteoporosis, including greater risk for vertebral fractures, greater risk of falls and fall-related fractures. And, not only that—it is a contributing factor to a host of other health issues as well. People with hyperkyphosis are more likely to have difficulty performing simple daily tasks like bathing and washing themselves. They are also more likely to fall and hurt themselves. And all of this, unfortunately, paves the road to the nursing home. Hyperkyphosis has also been found to be a risk factor for fractures of the hip, leg, wrist, shoulder, and arm. The risk is greater the more hunched the back is. 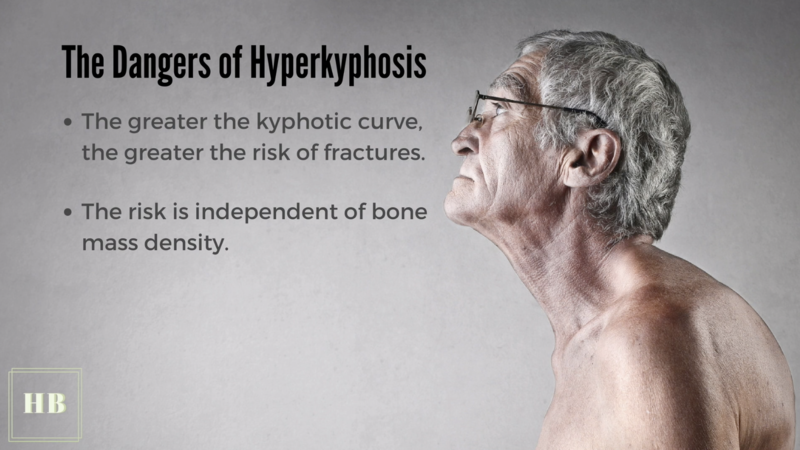 This risk is independent of bone mass density, which suggests that hyperkyphosisis a separate risk factor for suffering fractures, on par with osteoporosis. So why haven’t you heard about this before? Until recently, hyperkyphosis has been flying under the medical radar, because it was assumed that it was caused by osteoporosis. Doctors believed that it resulted from tiny fractures of the vertebrae, which in turn caused the spine to collapse forward into a dowager’s hump. It’s really only in the last ten years or so that medical researchers have started to label hyperkyphosis as an independent medical condition. And while there’s a growing number of studies coming out on hyperkyphosis and its effects, it’s still not a condition we read about very much in the everyday media. Unlike osteoporosis, it’s not something that your doctor will check out for you when you go to your regular physical. However, there’s every bit as much reason to prevent hyperkyphosis as there is to prevent osteoporosis, because it has many of the same negative consequences on our long-term health. You may be young or middle aged with no signs of osteoporosis or hyperkyphosis. So why should you worry about this issue at this point in your life? So why should you care? Well, you should care because the body takes its shape over years. 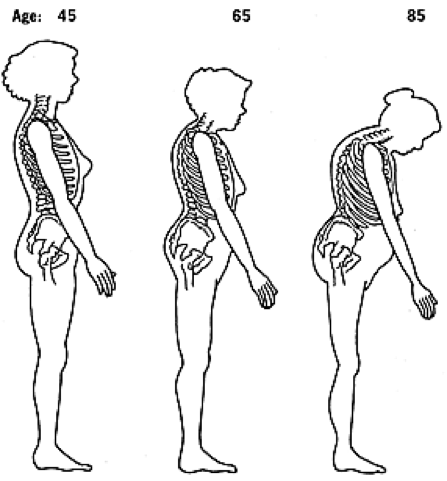 The foundation of hyperkyphosis and other posture problems is laid decades before it becomes a visible problem. So the time to focus on preventing hyperkyphosis is not when you’re 70 or 80 years old and have developed some degree of the condition. It’s never too late to change your posture, but the older you get, the more you have to swim upstream. So the best time to improve your posture and prevent hyperkyphosis from developing is when you’re in your forties, fifties, and sixties. Hyperkyphosis isn’t an either or. It’s a subclinical condition long before it turns into a Dowager’s Hump. The reason that we haven’t heard more about the health issues linked to hyperkyphosis is that has traditionally been thought to something that developed as a result of vertebral fractures caused by osteoporosis. If you take a look at this picture, you’ll see the wedge fractures of the spine marked in red. Those are the kinds of fractures that people with osteoporosis are at risk for getting. You can imagine if one or two of the vertebrae collapsed forward like that with several wedge fractures, that it will cause the thoracic spine to cave in on itself and create a more collapsed, hyperkyphotic structure. So, treatment efforts generally have focused on preventing osteoporosis to avoid vertebral fractures and prevent the Dowager’s Hump of hyperkyphosis. That really changed in 2004. In 2004, a groundbreaking study came out, which was the first to show that increased kyphosis does not necessarily result from vertebral fractures. In other words, hyperkyphosis of the spine is not identical with osteoporotic fractures. Another study, which looked at almost six hundred women between the ages of 47 to 92 over four years found that\ hyperkyphotic posture itself may be an important risk factor for fractures independent of low bone mass density or fracture history. The increased risk of people in this study was 70% increased risk of future fracture (of any type) independent of age or prior fracture. The greater the hyperkyphosis, the greater the risk. Why are people with hyperkyphosis at increased risk for fractures? Well, one reason is that they are more likely to lose their balance and fall. First of all, you can’t see very well and orient yourself to the environment very well if you’re constantly hunched over. Also, the range of motion of the spine is severely reduced in people with hyperkyphosis. So if they fall, it’s harder to catch themselves, and they just kind of tumble over. The other health consequence of hyperkyphosis is decreased mobility. People have more difficulty bathing and washing themselves. They have lower scores on what’s called the Timed Up and Go Test, which measures how quickly people get up from a chair, walk ten steps, go back, and sit down. This test is a very reliable predictor for general mobility in older people. Wendy Katzman, a P.T. at UC SF, who is a leading researcher in this area, notes that this kind of decreased mobility is associated with advancing age, muscle weakness, low bone density, and a history of vertebral fractures. However, distinct from previous studies, she found that hyperkyphosis is a significant contributor to mobility impairment, independent of underlying low bone density and vertebral fractures that often are assumed to be causative factors of ill health. 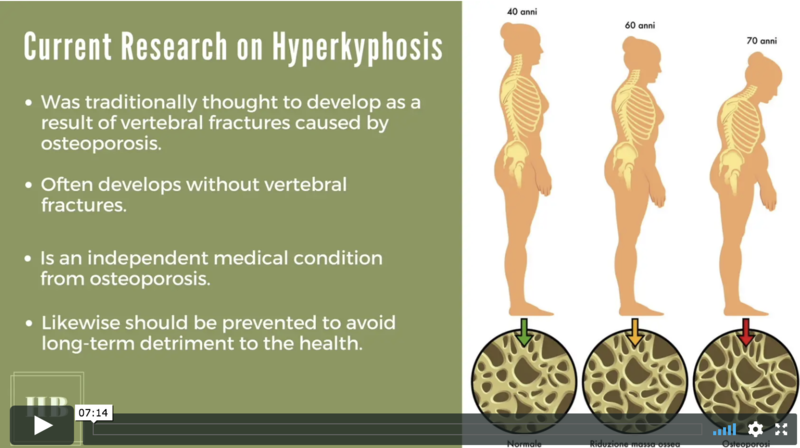 So again, hyperkyphosis has many of the same health consequences that we work so hard to prevent in people with osteoporosis, but no one is paying attention to this condition. One of the issues of osteoporosis is that 25% of people who have a hip fracture end up in a nursing home within a couple of years. They lose mobility, and they become unable to take care of themselves. Here again, Wendy Katzman points out you have the same issue with hyperkyphosis and it really should be attended to in the same way as we are concerned about osteoporosis. Why Is No One Paying Attention to the Health Risks Linked to Hyperkyphosis? We spend a lot of money in our society on tests for low bone mass density and drugs to increase bone mass. But of course, the real risk of osteoporosis is not low bone mass. It is really fractures. As recent studies show, hyperkyphosis is a separate risk factor for fracturess. However, so far, it has pretty much has been falling under the doctors’ radar. No one checks you for risk of developing hyperkyphosis when you go for your physical. But if older people with hyperkyphosis really are at a 70% greater risk for fractures, this really is a health issue that should not be ignored. There is growing awareness in society of the health issues linked to forward head posture and hyperkyphosis. However, the medical establishment has little to offer for the condition, both by way of prevention and treatmnet. So not surprisingly, there is growing interest in alternative approaches to improving posture, including yoga. Pilot studies have documented the benefits of yoga for hyperkyphosis, and this is an area of research that we can expect growing interest in in the future. Curious to Learn More about Yoga for Posture Improvement and Hyperkyphosis Prevention? Take a Peek at the Excerpt from YogaUOnline's Course on Yoga for Posture Improvement - The 7 Steps to a Better Posture offered as part of YogaUOnline's Yoga & Wellness Educator training.